Even though our understanding of corporate governance has evolved from a rigid model of ¿command and control¿ toward a more flexible model of incentive mechanisms, numerous and major shortcomings continue to plague efforts to resolve the conflicts of interest inherent in the managerial approach to corporate control. In this stimulating book the work of ten outstanding scholars in the field converges, along different avenues of research and analysis, toward a vital critique of two assumptions in currently dominant economic theory: that uncertainty can be reduced to numerical probabilities, and that contracts can be ¿complete,¿ that is, capable of establishing beforehand an efficacious solution for all possible eventualities. rescue of firms in financial distress. What the common undertaking of these authors finally reveals is of immeasurable value to business leaders: potent suggestions that foster the development of a reflexive capacity among actors in corporate governance to isolate what the real problem is, to identify the elements of the context that it would be expedient to transform, and to construct collectively the modalities of an effective transformation. Introduction; R. Cobbaut. Part 1: Theories. 1. 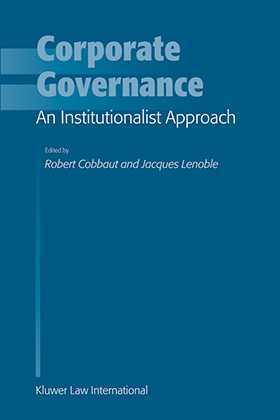 From an Incentive to a Reflexive Approach to Corporate Governance; J. Lenoble. 2. The Micro-Foundations of Shareholder Value: A Critical Survey of Contractarian Approaches; A. Rebérioux. 3. The ¿Financialisation¿ of the Economy, Macroeconomic Regulation and Corporate Governance; M. Aglietta, R. Cobbaut. 4. Financial Systems and Modes of Corporate Control; M. Aglietta, R. Breton. Part 2: Case Studies. 5. The Company Law Review in the UK and the Question of Scope: Theoretical Concerns, Practical Constraints and Possible New Directions; J. Paterson. 6. Employees¿ Financial Participation in the French Legal System; A. Autenne. 7. Layoff Decisions and the Financial Market: Illegitimacies of the Financialisation Convention; T. Boyer. 8. Norms in Private Insolvency: The ¿London Approach¿ to the Resolution of Financial Distress; J. Armour, S. Deakin.